Apartment description - 2 bedroom apartment with 1 full bathroom, with bathtub, toilet, sink. Outdoor garden area furnished with table and 4 chairs and potted plants. Window bars in all windows and door to garden for full security. Complete kitchen including oven, microwave oven and half-size refrigerator. Hardwood floors, carpets, duvet covers. Close-up view to the Blue Mosque (Sultanahmet Cami) from bedroom. All rooms with ceiling fans. Master bedroom has 150 x 200 cm bed (queen size). Second bedroom has one single bed (90 x 190cm). 200x150 cm sofa-bed in living area. Location - The apartment is by Sultanahmet Meydani, the Square in between the Blue Mosque (Sultanahamet) and the 500 AD Aya Sofya (or Hagia Sophia). Just a couple of minutes walking away from each, and next door (50 m) to the Four Seasons Hotel, where you can have breakfast, or at any of the numerous restaurants in the neighborhood. Transportation - From Ataturk airport this apartment can be reached by metro + tramway. The apartment is close to the Sultanahamet tramway station. Just walk across the Square in between the mosques and it is right there. Management - We are a small family company. Lauren is from Dallas, TX and Fernando is from Barcelona, Spain. We currently run 16 holiday apartments in Barcelona and 2 furnished homes in Dallas. We apply our same high standards in every country. We love Istanbul and we hope you will also love to stay in our second unit in Sultanahamet and the fourth in this incredible city. Elif and Marco take care of our Istanbul apartments and they will take care of your stay. Noise levels - The apartment has double glazing. The location is quiet but there is a loud nightly call to prayer 1 hour before sunrise. Occupancy - The apartment is ideally suited for 3 people. It can sleep up to 5, but we only recommend that if two are children. Check-in and check-out - The apartment will be ready for you at 16:30 for occupancy. You can drop your bags and get your keys from 12:00 (noon). Our greeter will be at the apartment to greet you and hand you the keys. The check-out time is 11:30am. You can request reserved early check-in or late check-out for a small fee, subject to availability. There is no extra fee for nighttime check-in. Extras - Introductory neighborhood tour. Transportation to and from the airport. Groceries on arrival. We are a small family company. Lauren is from Dallas, TX and Fernando is from Barcelona, Spain. We currently run 20+ holiday apartments in Barcelona (Spain), 2 furnished homes in Dallas (TX), and 4 holiday apartments in Kraków (Poland). We apply our same high standards in every country. We love Istanbul and we hope you will also love to stay in our second unit in Sultanahamet and the fourth in this incredible city. Elif and Marco take care of our Istanbul apartments and they will take care of your stay. This property is in an unbeatable location, in between the magnificient Blue Mosque and the millenary byzantine church/museum Hagia Sophia. Being sooooo close to the sights. 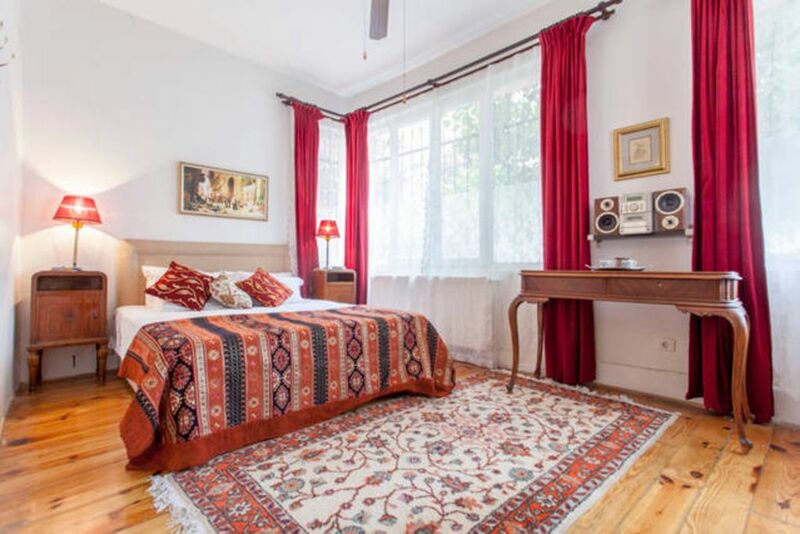 Cozy apartment (with heating, which is important in March), located in the center of Sultanahmet, literally 100m from the Blue Mosque and 400m from the tram stop! The owner provided all the useful information and was easily accessible. We enjoyed a week and hope to return next year ! I would recommend to anyone visiting Istanbul. Great flat, clean, cosy and very silent, despite its location 100 meters (really!) from the Blue Mosque and Saint Sophia. I would highly reccomend it, even for 5 people. Some nice extras: great the terrace with the table to have breakfast or dinner, great the washing machine, to wash and dry your clothes after your trip. The flat was easy to find and it is really close to the hagia sophia and the blue mosque. Because of the restaurantes around there is always a certain acoustic level, but never mind. I didn't have a problem with it and I had my window opened all night long..
My friend who slept in the other room did mind, because in the backyard there were birds chirping all night. There is just one thing that I didn't like about the flat: It smelled very fusty - like it hasn't been aired for ages - the bed linen were a bit clammy because of that. But that is just a small note. It is a good place to stay for a few days. What a neighborhood feel. much more personality than any boring hotel room. All modern conveniences. Host was exceptional, thank you Marco. Traveled with 3 children 8-12 years of age. My 12 year old says bring ear plugs, but by the second day he was sleeping right through the competing calls to prayer from the various mosques nearby. Plenty of shops and restaurants within walking distance. The Four Seasons is literally around the corner and "if you fancy a spot of tea", well I guess that'll do. Metro stop is an easy 3 block walk. Very clean.